With the Government reaffirming its commitment to electric vehicles (EVs) in Budget 2018 and Ministers pledging that only zero emission vehicles will be on sale here from 2030, the subject of EVs is now certainly on the agenda. Leading car sharing company GoCar is adding five new Renault ZOE Z.E. 40 fully electric cars. The expansion of the GoElectric fleet gives GoCar members the chance to drive the Renault ZOE Z.E. 40 with a battery that provides exceptional range (400km NEDC, 300km summer, 200km cold winter), giving drivers the freedom to travel further afield if wished. The ZOE’s impressive driving range also helps to remove the final psychological barrier that stands in the way of driving an electric car – so called ‘range anxiety’. GoCar first launched its GoElectric fleet in October 2016 and since then over 800 customers have chosen an EV to drive. Last year 622 fully electric cars were sold in Ireland, an increase of almost 59 per cent on 2016. Driving a Renault ZOE Z.E. 40 is a surprising blend of punchy performance and peace and quiet. The R90 electric motor instantly delivers maximum torque of 225Nm, producing brisk acceleration and pickup from low speeds. The car effectively accelerates from a standstill to 50km/h – the normal speed limit in city driving situations – in just four seconds. 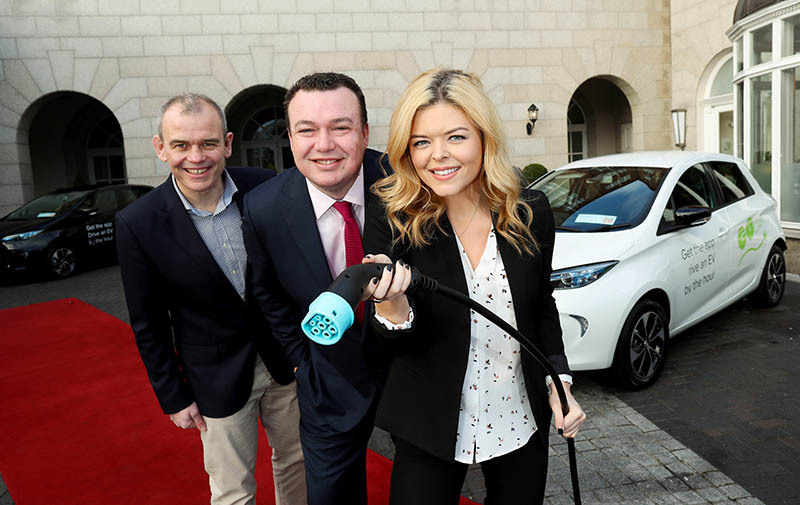 Renault Ambassador Doireann Garrihy pictured with Paddy Magee, Country Operations Director, Renault Group and Colm Brady, Managing Director, GoCar charging up the new Renault ZOE at the announcement of the expansion of GoCar’s electric fleet in Dublin. The ZOE Z.E. 40 is the ideal EV for GoCar customers whose journeys include visiting friends or family, weekly shopping, work meetings, and day trips out of the city. It’s a compact car for great manoeuvrability, but with a spacious interior and a large boot, so ideal for urban adventures. With hourly pay as you go driving and no subscription charges, GoCar is ideal for people or organisations who only need occasional access to a car but don’t want to own one or families who need a second car sometimes. By allowing multiple people to use the same vehicle at different times, each GoCar replaces up to 15 private cars, reducing car ownership and car dependency, congestion, noise and air pollution, and freeing up land traditionally used for parking spaces. After reviewing the most popular locations, GoElectric vehicles will be located near public charge points, using these points when they need to be charged, and parking in regular spaces when they’re fully charged. The GoElectric ZOE will be €10 per hour, with 50KM of driving included on each trip. ZOE Z.E. 40 is the only EV that can charge at 22kW at all 1,200 ESB eCars standard AC charging points. This allows ZOE to add 75km of summer range in just 30 minutes, or a full charge in about 2½ hours. Patrick Magee, Country Operations Director, Renault Group Ireland: “The success of electric vehicles is very much down to building awareness amongst the general public of the benefits, infrastructure, incentives and getting commitment from Government and manufacturers to really highlight what electric cars are all about. Renault Group is very committed to the electric vehicle in Ireland and in Europe where our models are the best sellers, with ZOE still Europe’s best-selling electric vehicle. We are delighted to work with GoCar again, this time with EVs, and look forward to seeing the uptake on drives in Dublin. It’s a great awareness building exercise and will bring EV driving and its benefits to an audience who don’t own a vehicle yet like the option of having one when they need it. ZOE is the ideal urban car, but with an exceptional range that can allow the driver to move out of the city and drive much further afield, if they so wish”.